Brining is the process of marinading a piece of meat in salted water (even shrimp will benefit from brining) to affect its flavor and texture when cooked. The final result is often a juicer turkey or pork roast that's also easier to slice or carve. Just as vinegar is the basic ingredient in barbecue marinades, salt is the basic ingredient in brine that breaks down meat at the cellular level, allowing more moisture to permeate the meat. The result is usually a roast that is plumper and juicier than if you hadn't brined it, and often makes for a mouth-watering masterpiece when cooked and served. Adding the proper amount of salt to make your brine depends upon how quickly you want the brining process to work. 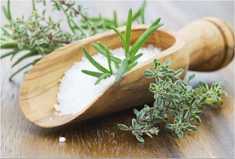 Those on a restricted low-salt diet may want to use less salt and lengthen the brining time. Otherwise, the basic brining recipe usually calls for a ratio of 1 cup of salt to 1 gallon of water. While the 1 cup of salt = 1 gallon of water ratio is a common recipe, experts differ on the timing of how long to brine. Some suggest at least 6 hours, others recommend overnight, and still others recommend 3-4 days for maximum results. A happy medium? Try several hours for chicken and at least 8 hours for turkey. 24 hours (or longer) of brining time is usually your best bet for denser pieces of pork. thyme, sage and other herbs & spices. • Start with cool water, add the salt and meat, and refrigerate. • For larger roasts, dissolving the salt first in hot water will guarantee a more thorough brining. When using this method, remember to let the water cool before adding the meat. To avoid the growth of bacteria inside the container, refrigerate immediately and keep the meat at a minimum 40 degrees or colder throughout the brining process. • Brining containers may include stainless steel pots (aluminum is not recommended) plastic buckets, ice chests or coolers, or heavy-duty zip-loc or plastic bags. Just make sure they are large enough to thoroughly cover the meat as it brines. • NOTE: Before cooking, give the meat a thorough rinse in cold tap water to remove the excess salt. Pat dry before roasting. Besides using basic table salt, many brining experts like to experiment with different ingredients in their brine to enhance flavor. A three-to-one ratio of salt to sugar is a common practice. Additional ingredients may include garlic cloves, peppercorns, thyme, sage, and other herbs and spices, along with honey, maple syrup, apple juice, or pineapple in various amounts to taste. All About Brining - A comprehensive guide including a discussion on how brining works, suggestions on which meats, poultry or fish to use, a table of brining times, how to calculate table salt - kosher salt ratios, and more with related recipes. Brine Recipes - Brines for every kind of meat, fish or poultry - Discover over a dozen different recipes for turkey brine including more for chicken, pork, pork tenderloin, fish, and corned beef.